Wash Bengal gram dal and strain water from it. Potato skin is peeled and quatered. 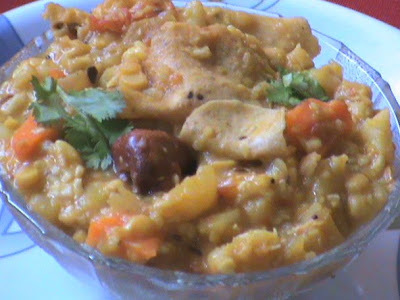 Pressure cook Bengal gram dal and quatered potato, so that it is cooked completely. Cool and smash the contents. Heat oil in a pan, fry the pappads to golden and set aside. Heat 1 tbsp of oil, temper with mustard, cumin, split urad dal, asafoetida, curry leaves. Add chopped onion, green chilly and toss, until it turns to light brown. Add chopped tomato pieces, allow to cook. Add turmeric pwd, salt and cook it covered for 5 mins. 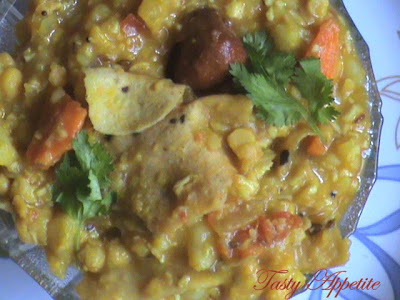 Add smashed potato and Bengal gram dal, combine completely. Add the fried pappad pieces and break them by stirring. Add ½ tb water, mix gently. Keep in simmer for another 5 mins. Add coconut flowers, mix them and remove from heat. Serve hot with chopped coriander garnishings. 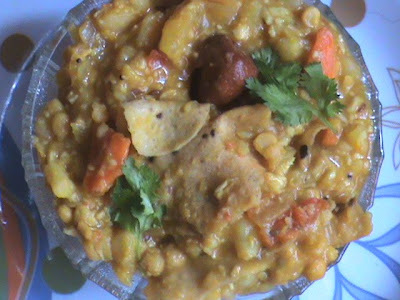 Tasty Appalam kuttu, ready to serve.